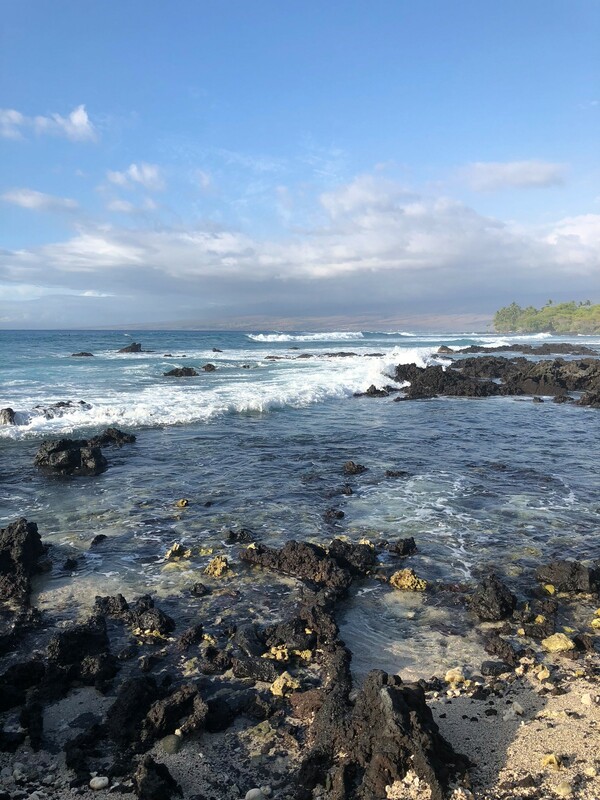 After coming out of the fog of jet-lag, I wanted to take the chance to share my time on the latter half of my trip to the Hawaiian islands. The wi-fi (or “coconut wireless” as it was described to me by the locals) was never really strong enough to upload any pictures. But better later than never. So if anyone was following my Instagram, than you know it goes without saying that Kauai is beautiful. Known as the “Garden Island” for its lush landscape, every corner of the island presents jaw-dropping views. Seriously, it never got old. I honestly don’t know how you ever get used to living there. I joked that it was like living in Jurassic Park only without the problematic neighbors. Although, I would be remiss if I didn’t mention certain locals that you will find EVERYWHERE on the island. 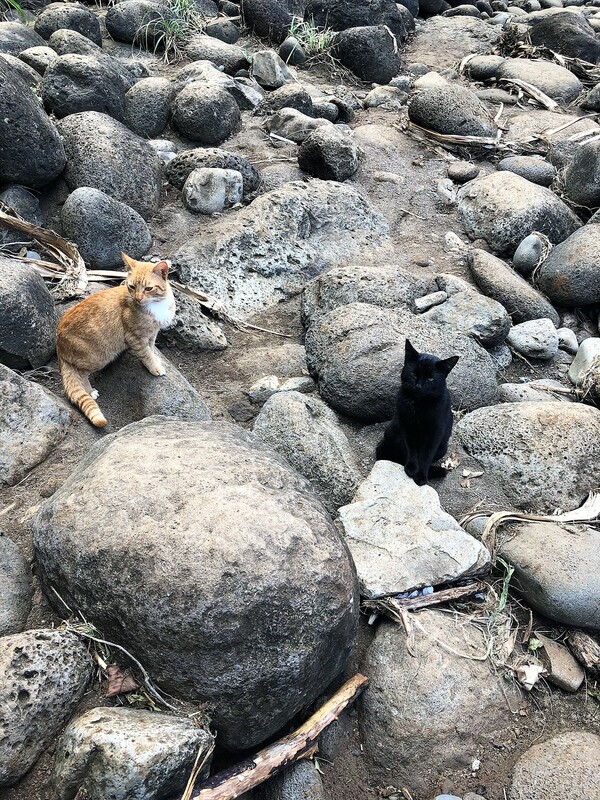 These guys are like the mascot of Kauai. And I wouldn’t mind them as much if they didn’t try to hop into the car. Though, as friend pointed out, that’s like dinner to go, right? 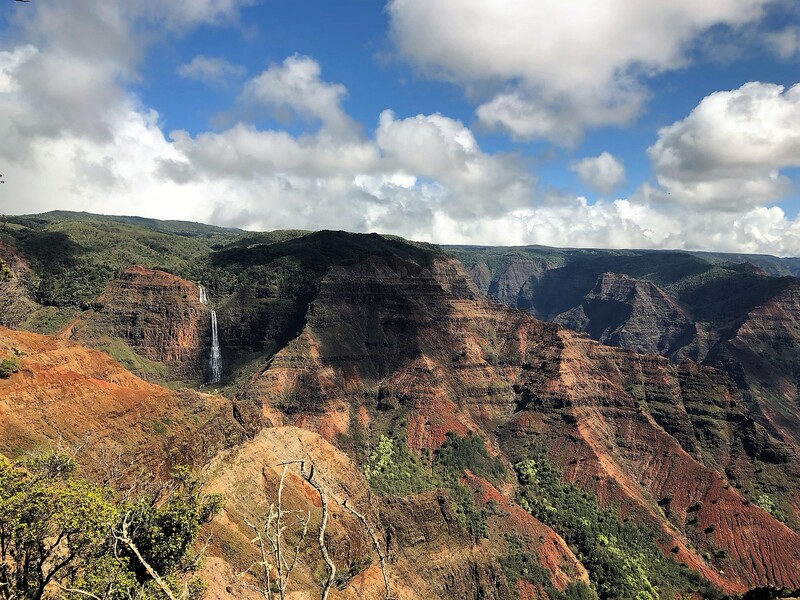 While, the Na Pali Coast is one of the more recognizable spots in Kauai, I would also like to showcase one of the more awe-inspiring sights that I encountered – the Waimea Canyon. 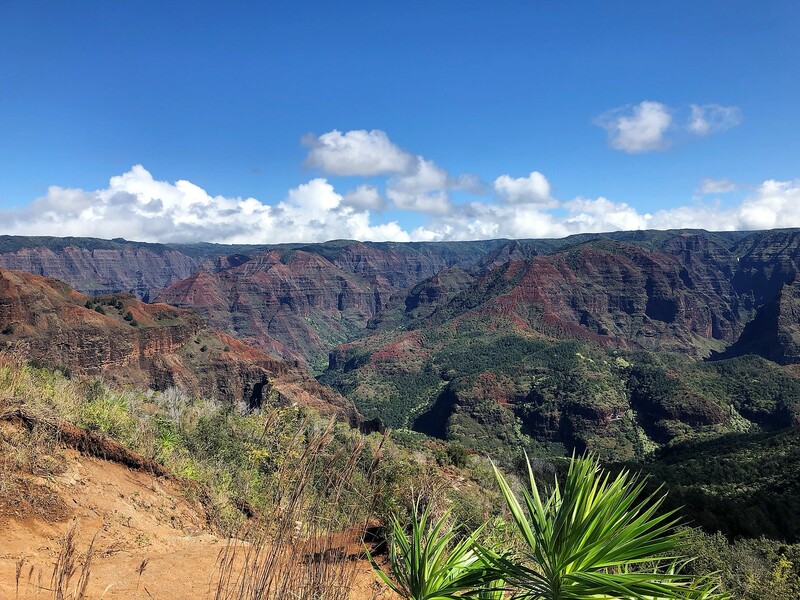 After I said goodbye to Kauai, I made my way over to the island of Hawaii (or Big Island). It was here that I completely relaxed and let the laziness of the islands permeate my day-to-day life. 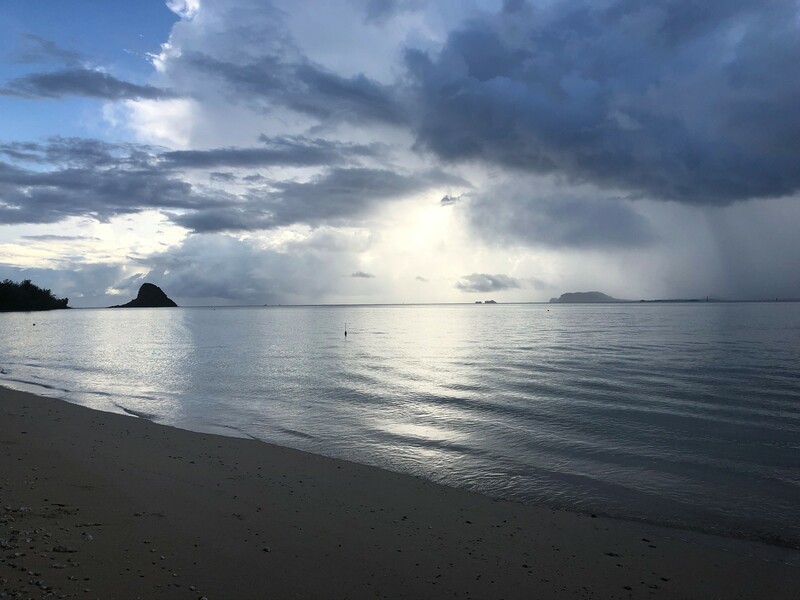 As someone who used to be in a rather stressful position (seriously, my job caused me to get migraines weekly for the first time in my entire life), this quite possibly was the greatest gift that the islands could have given me. For the first time in awhile, I felt inspired to really get good work on my novel. And for that, Big Island was probably my favorite and the one I would jump at the chance to go back to. 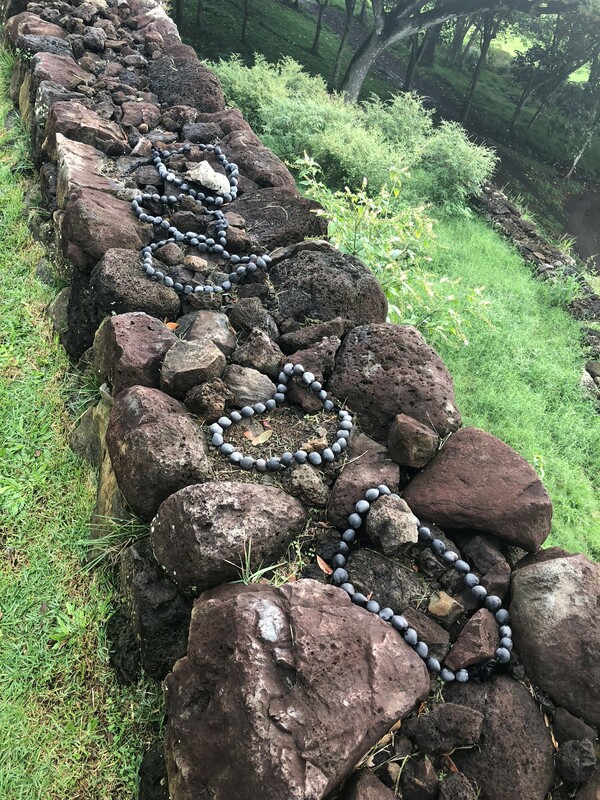 Now lest you think that I didn’t get out of my writer’s nook, I did venture around to see some of the beautiful sights of the Big Island. One of my favorite thing to do was to catch the sunset on one of the beaches. 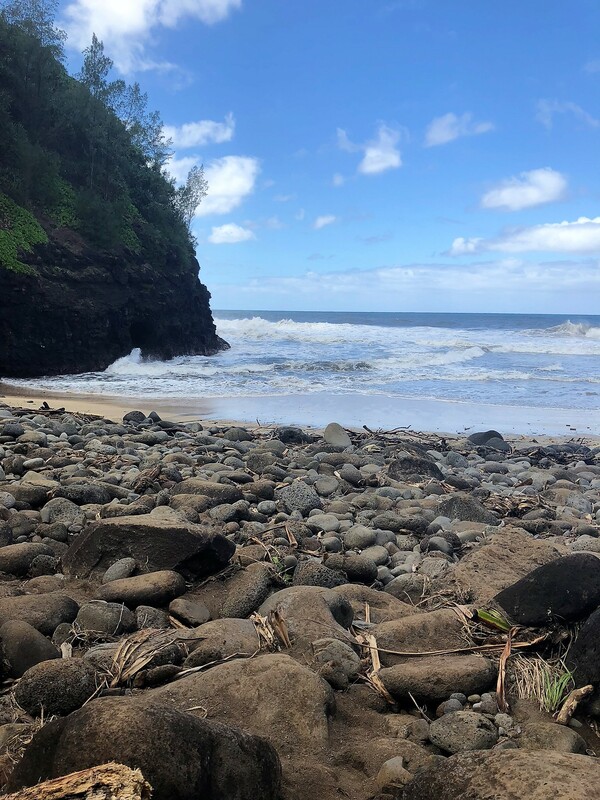 Specifically, I fell in love with a beach called Waialea. I still dream of it honestly. I am a fairly clumsy person. Actually, I can lose balance while standing still. When I was younger, it was a huge factor in me shying away from most organized sports. The anxiety of falling on my face was always at the forefront of my mind. And it’s a hesitation that I have carried well into my adult life as well. I hate exercising in front of anyone because I feel like I’m going to go crashing into something. But when you decide to travel the world, well, you need to SEE the world. Nothing was more important to me than being able to see the natural beauty in the world. 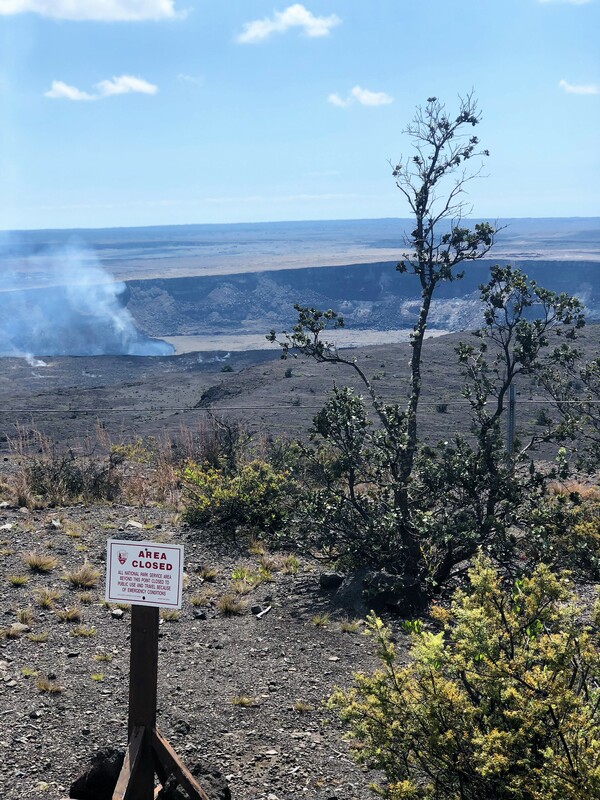 So when I decided to hike part of the Kulalau trail, I was nervous. Up until now, I had done fairly straightforward (read: simple) hikes. 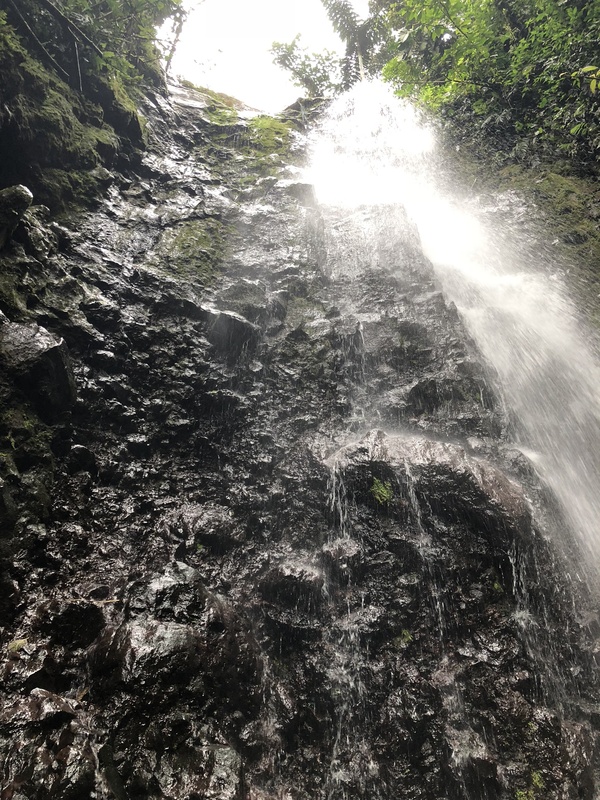 And while I wasn’t embarking on the 11 mile trek up the Na Pali Coast, the first two miles were described as “strenuous” and “difficult.” A couple different times, I chickened out. I wasn’t strong enough. I was going to be slow. I was going to be in the way. I was going to fall down the side of a cliff to my final resting place. 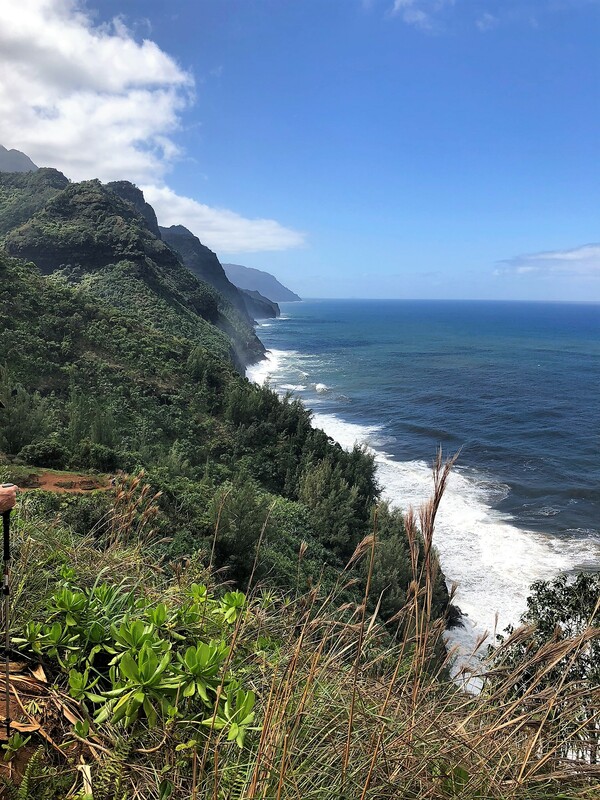 The Na Pali Coast is one of the most beautiful sights in the world and it’s one that can only be traversed via hiking. There are no roads. 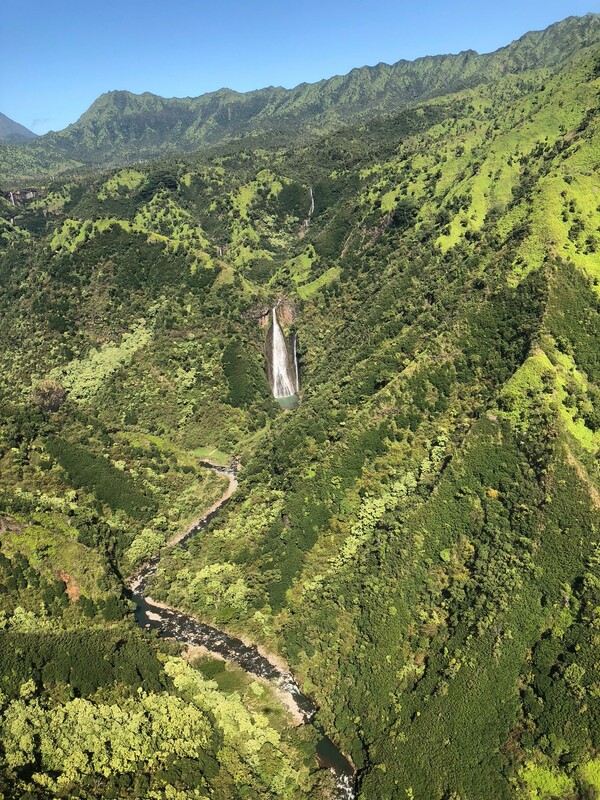 I took a helicopter ride yesterday and saw it from the sky but I couldn’t shake the feeling that it wouldn’t be the same as trekking through the trees. I couldn’t pass up this opportunity. So, I set my alarm to get up and tackle it early. And I ignored the alarm. I went later in the day. My butterflies and anxiety were taking control as I began driving to the end of the road. I told myself that if I was able to get parking than I would have do it. And just like that, I almost immediately got a spot right at the trail head. 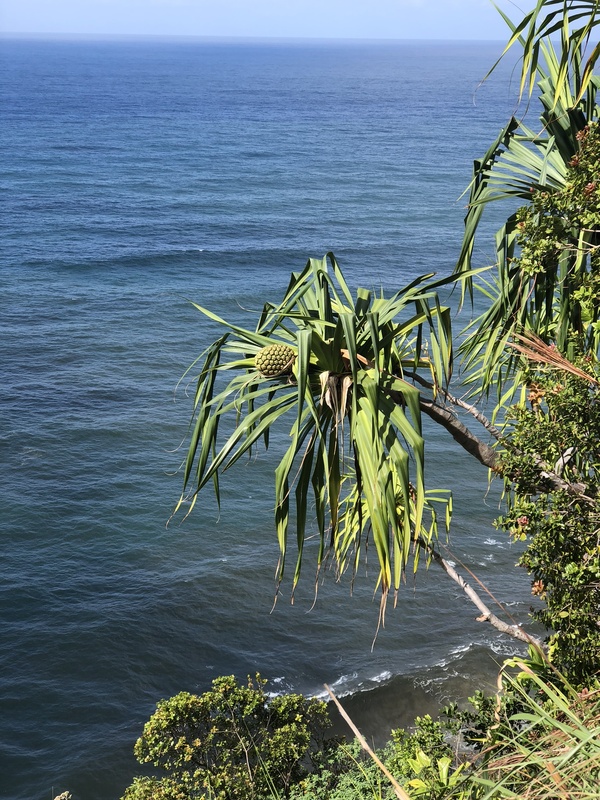 So, with water bottles and a small lunch to eat at the end, I began the mostly uphill climb towards Hanakapiai Beach. And man was this hard. The trail is mainly comprised of rocks and dirt. Oh, and mud. There is a lot mud. And that mud is usually caked onto the rocks making them slick and slippery. Getting dirty is a necessity on this trail. It was easier to just walk through the puddles to get to a better foothold. There are several points where you almost need to scale the rocks like a wall both up and down. 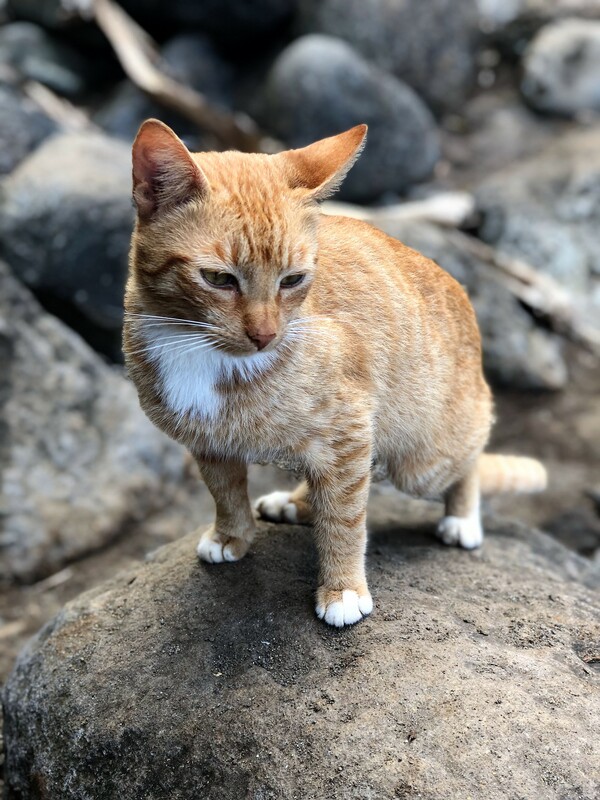 After wading through a pretty strong stream, I gently collapsed on the rocky beach of Hanakapiai. It’s a beautiful sight but that goes without saying in Kauai where everything is beautiful. (Though DO NOT go swimming here. The currents are so strong that this beach has actually claimed lives.) And I even met some of the locals. My new kitty friends really wanted my sandwich but, sadly, I had to move on back towards my car. This part of the hike was actually the hardest part because navigating down slippery rocks is considerably harder than climbing up them. I was constantly anxious about the amount of people on the trail. If I tried to move too fast, I was slipping and it I took it too slow than I felt like I needed to stand to the side. With every step, my brain was throwing every negative comment it could concoct, taking advantage of my anxiety. I’m not strong enough. I’m not agile enough. I’m going to fall. They’re laughing at you. You and your clown feet are going to trip and fall face first into a puddle of mud. But gritting my teeth, I made it to bottom. I was covered in mud. My knees felt like they were going to explode. But I made it. Despite myself, I had managed to traverse even just a little bit of the Na Pali Coast. Everything is going to hurt tomorrow but it was worth it. If only to prove to myself that I can do it no matter what I try to tell myself. There’s just something about this place that makes you push yourself. I will truly be sad to leave. Musubi and udon and ramen, oh my! Honolulu is surprising in the best sort of way. Familiar restaurant chains dot the main roads in Waikiki like beacons to the average tourist. There’s a street of luxury brand stores meant to entice. But, thankfully, in between all of this is bits of culture that helps set this city apart from Anytown, USA. (They also really love Spam here and that’s definitely a first for me). Other than eating all the different sorts of cuisines that are on every corner (Udon! Tempura! Poke! Ramen! Mochi doughnuts! 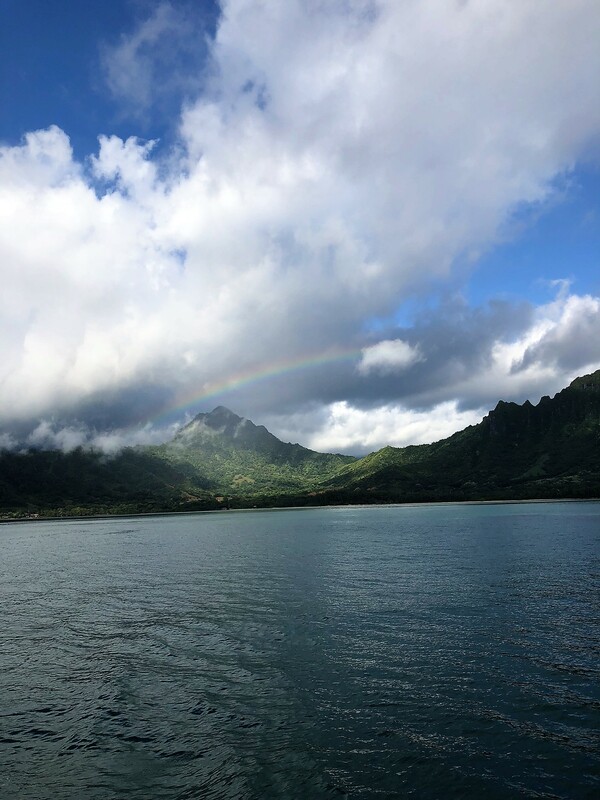 I could go one with all the rather exciting culinary delights here), my biggest goal while here in Hawaii is to appreciate the natural beauty. Even though it was cloudy during my time in Waikiki, it is still really gorgeous here. (It definitely makes me look forward to exploring the other islands). 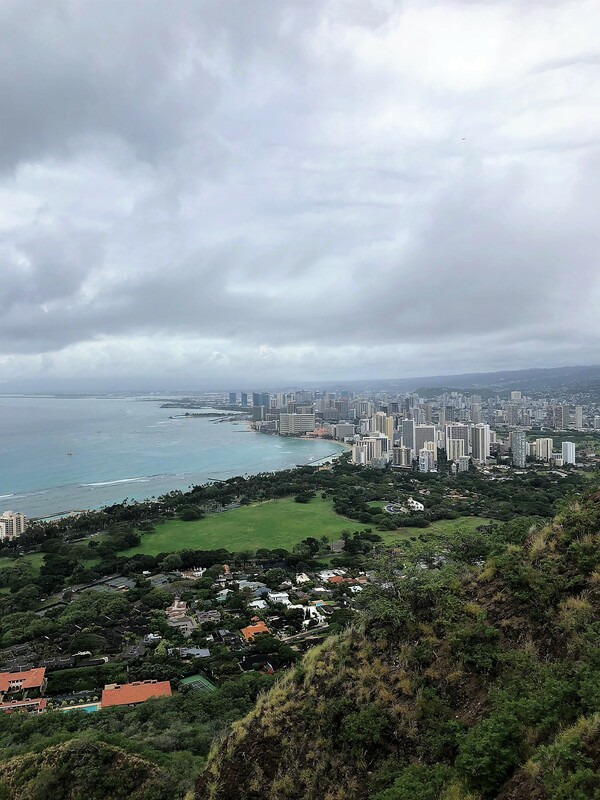 First up, I made the trek up to the popular Diamond Head Crater. 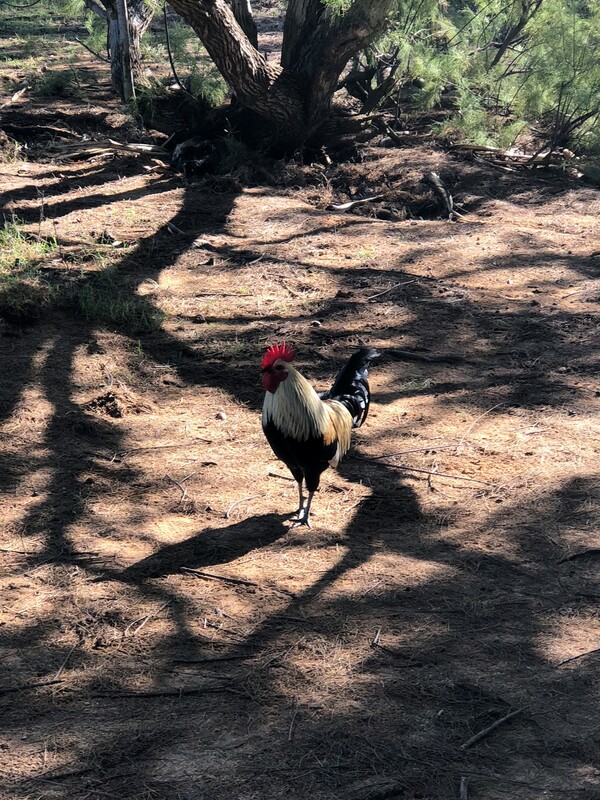 Even though it was a fairly quick hike (though I try to take these things slow as I’m still coming off of office life where I sat down all day), it will definitely make your heart race. The inclines are not steep but they do not let up. Oh and did I mention the stairs? 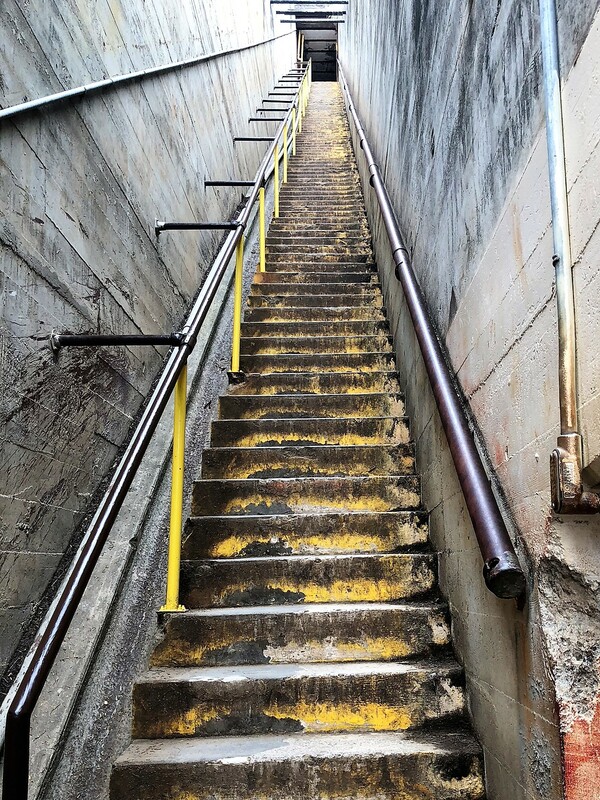 The stairs are killer. But you are rewarded in the end by an exhilarating view of Honolulu. 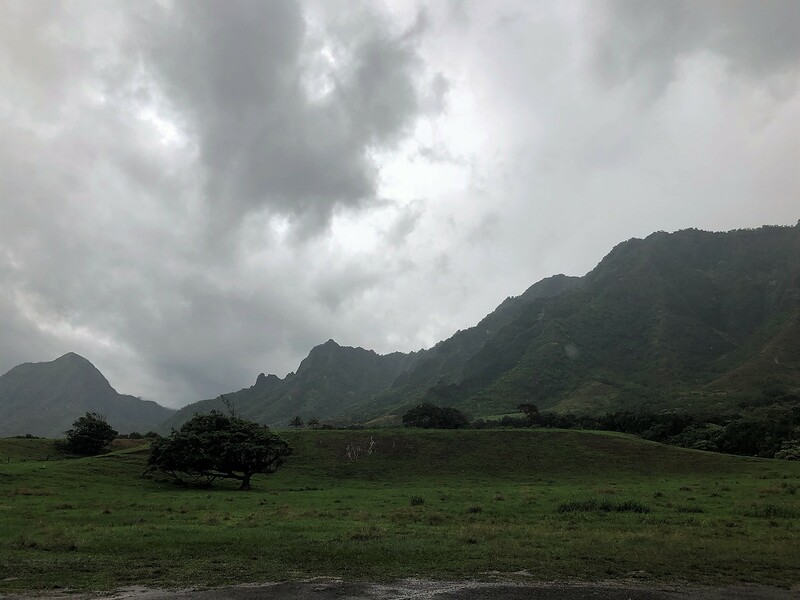 My second full day was spent at the Kualoa Ranch and Nature Reserve. Although this is a working ranch it is very popular for another reason. 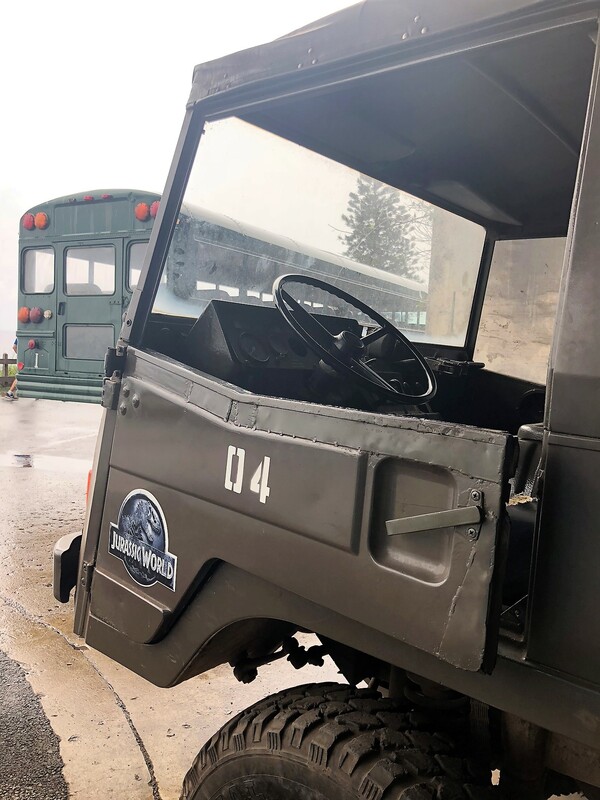 It has been used in numerous movies and TV shows – most notably Jurassic Park and Jurassic World. I admit that I adore those movies for the sheer ridiculousness so this was kind of cool for me. 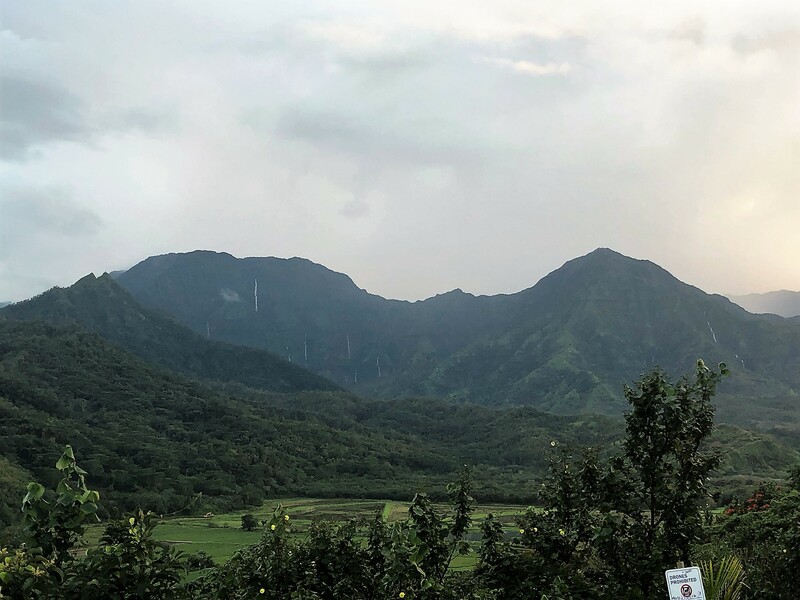 We drove through the Indominus rex’s paddock from Jurassic World and through the valley from the first film. 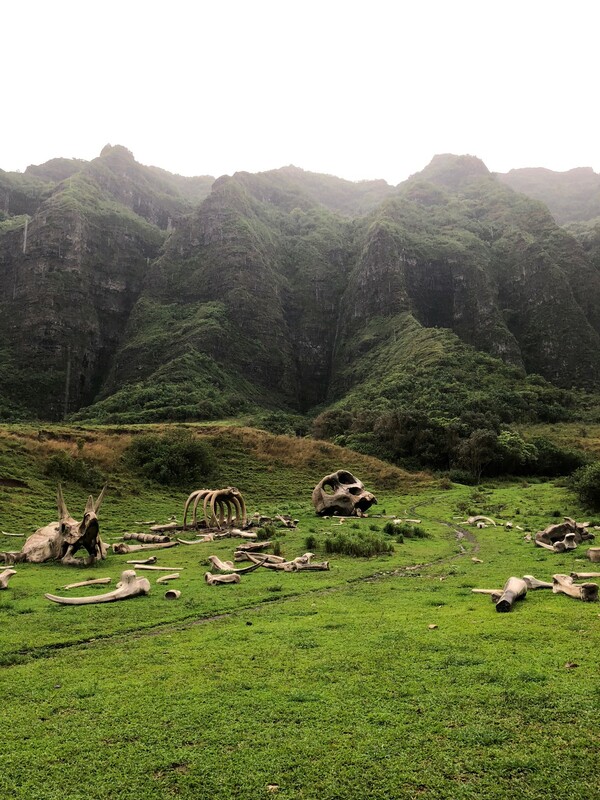 We also saw old sets from Kong: Skull Island and Lost. It was a lot of fun and the ranch itself is stunning. 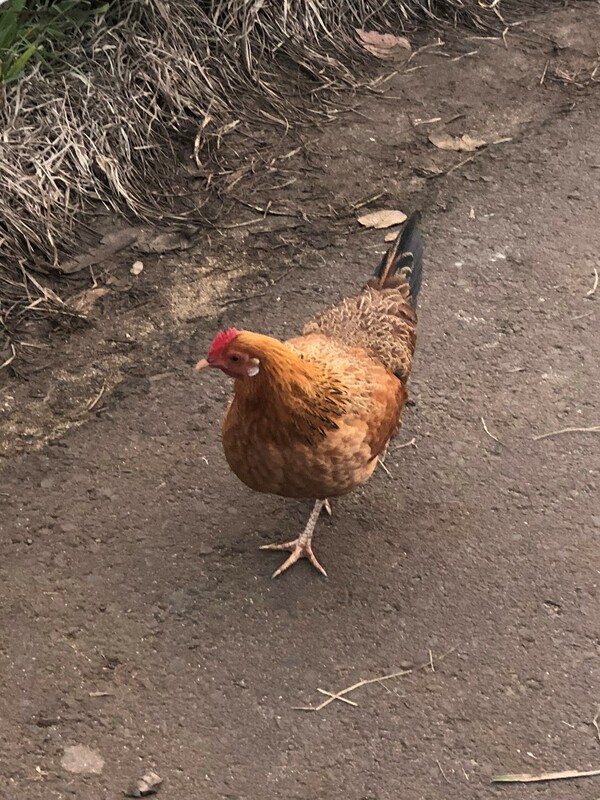 Tomorrow I board a flight to the Garden Isle – Kauai. 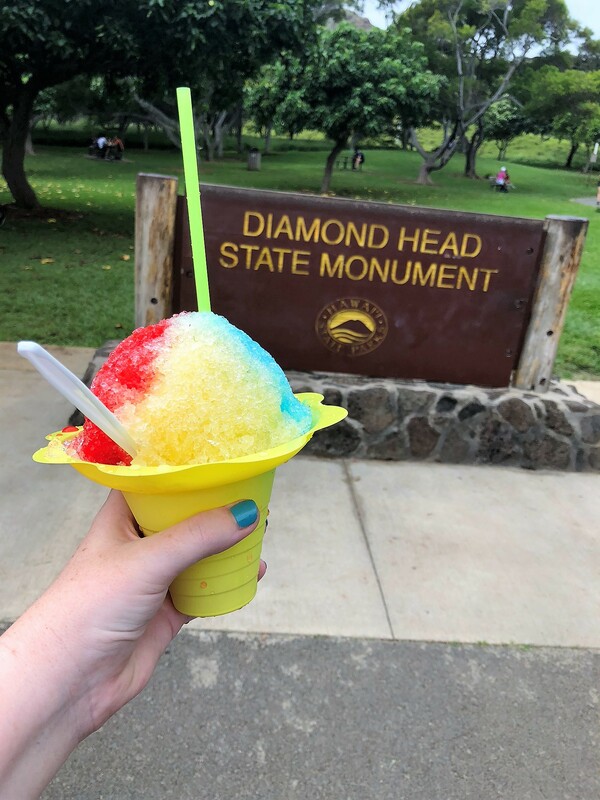 I have a busy couple of days planned for my time there – whale watching, a luau and a helicopter ride (if I haven’t gained too much weight from all the ramen). Until next time, aloha! Shameless plug: If you want to see more pictures, make sure to follow my Instagram (link under the title). I tend to post more pictures there as I travel around. As I sit in my hotel room, minutes away from LAX, I can’t help but have butterflies in my stomach. But as I get closer to my arrival to Oahu, I start to think past the shiny veneer of all the tourist ads. Anyone who knows me knows that the typical tourist attractions do not really draw much of my attention. No, I am more the type to want to wander the road less traveled (not to get too Robert Frost on you). I want to see culture in the raw. So while, yes, I’ll be doing some of the ordinary tourist things, my goal is to move past that. 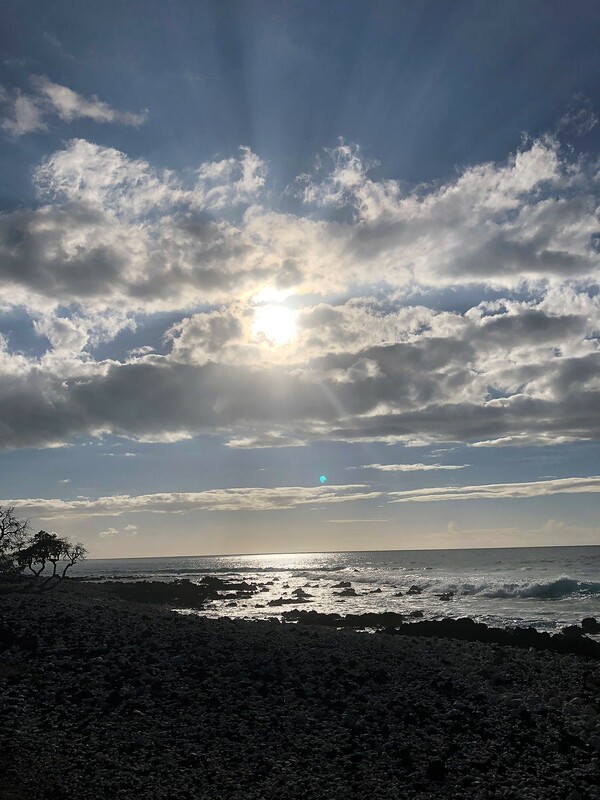 I want to be able to see and feel the spirit of aloha. I found a quote in my research that come back to me every so often. It speaks to the path that I’m currently traveling. While I don’t know if my dreams will come true I hope that me taking the time to even attempt what quote describes…well maybe I’ll come closer to what I’m meant to do. And who knows, maybe I’ll learn a little hula along the way. Until next time, mahalo! 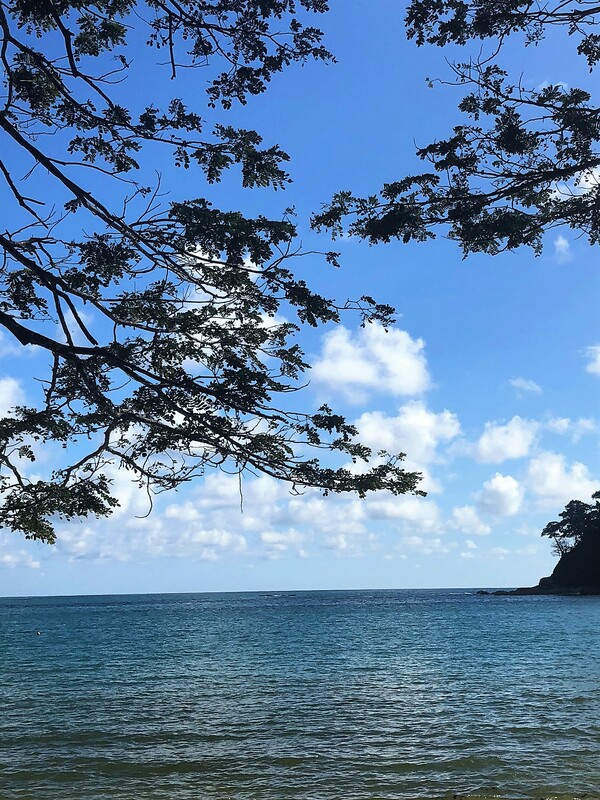 After the cold and rainy weather of Arenal and Monteverde, I traded clouds for sunshine. And while I certainly enjoyed my time up north, it was nice change to see the sun and feel the heat. 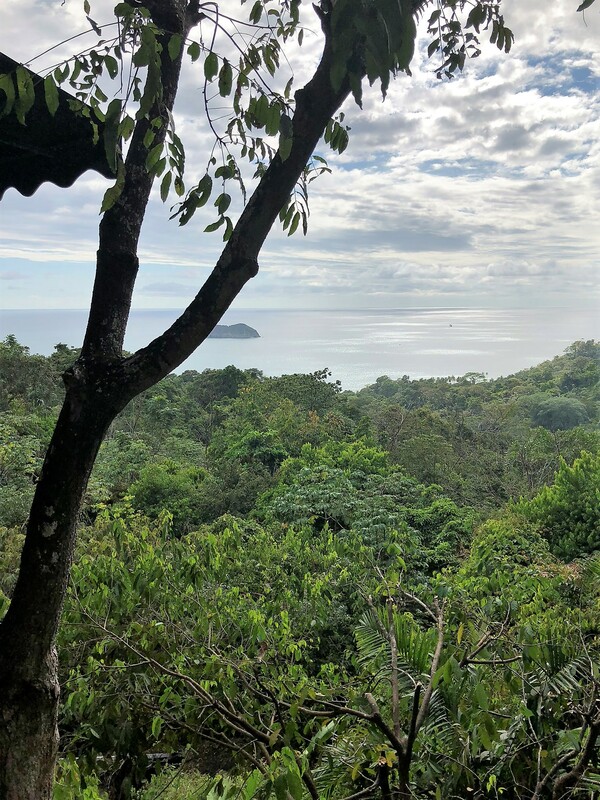 In truth, the area of Manuel Antonio is rather more what I thought of when I pictured Costa Rica. It was like an oasis, jungle and sparkling blue ocean. In my time here, I went on a hike to the national park here. It was a very easy hike to the beach within the park’s limits. 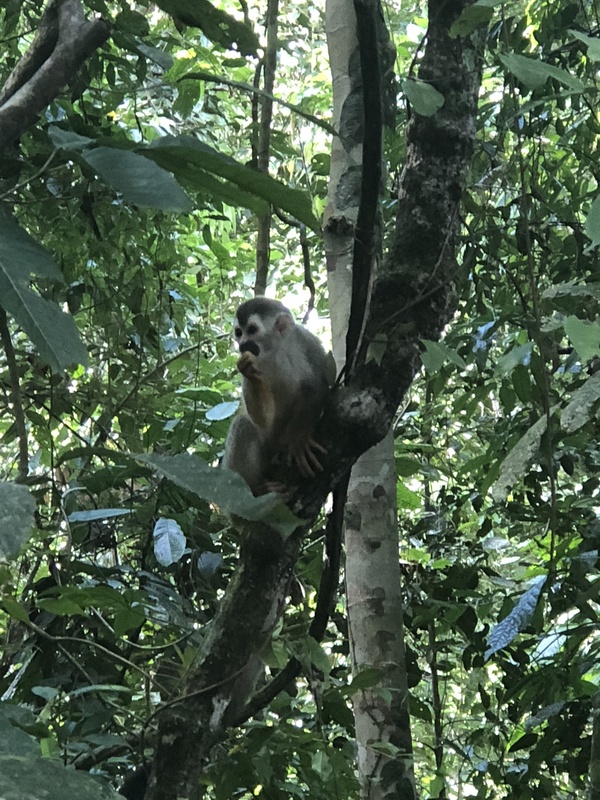 And while there were no real views to speak of (other than the very pretty beach at the end of the trail), the park makes up with it with all the different sorts of animals – mainly monkeys. These little guys were EVERYWHERE. They’ve become so used to humans that for the most part, they will hang out pretty close. 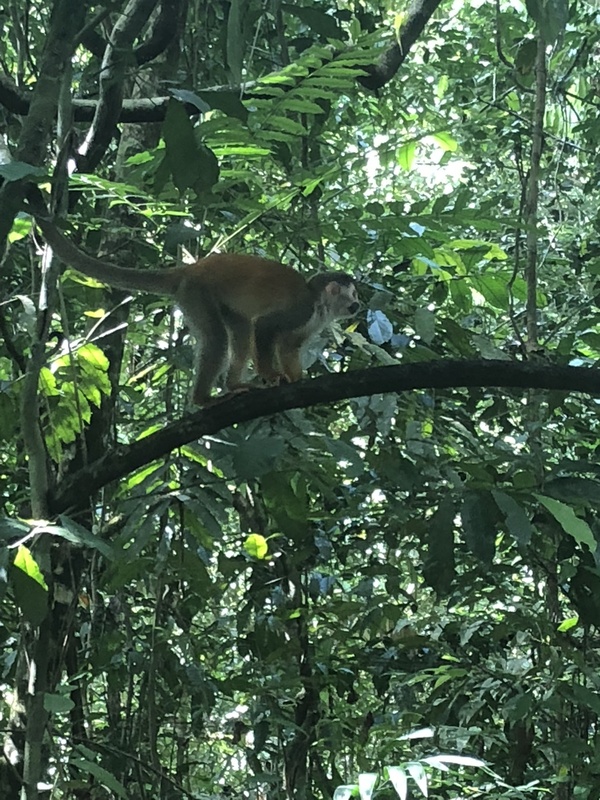 Our group was lucky because we even got to see the very shy squirrel monkeys. These little guys were my favorite cause they were just so darn cute. One of them was even following behind us as our group as our guide talked. 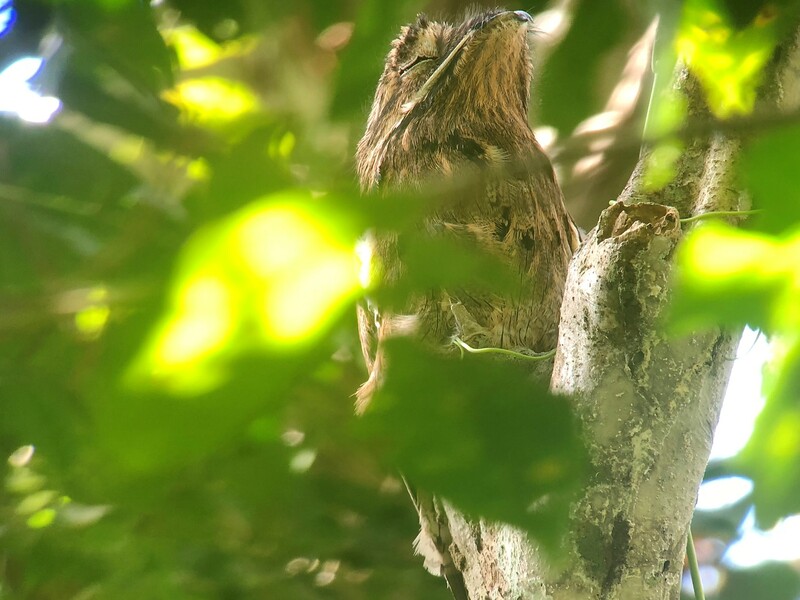 But on top of that we also saw different kinds of birds, crabs, frogs and even a lone sloth climbing a tree. 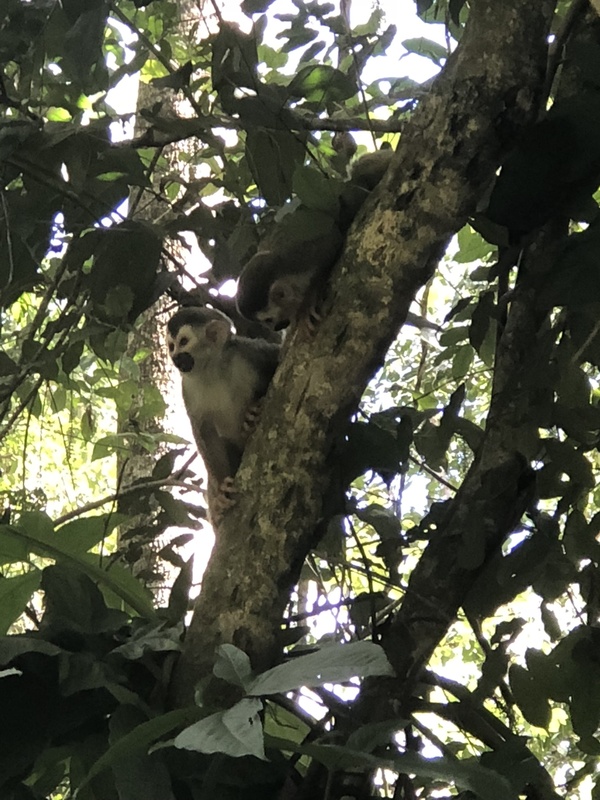 As we made our way to the beach, the capuchin monkeys began to make their appearance. 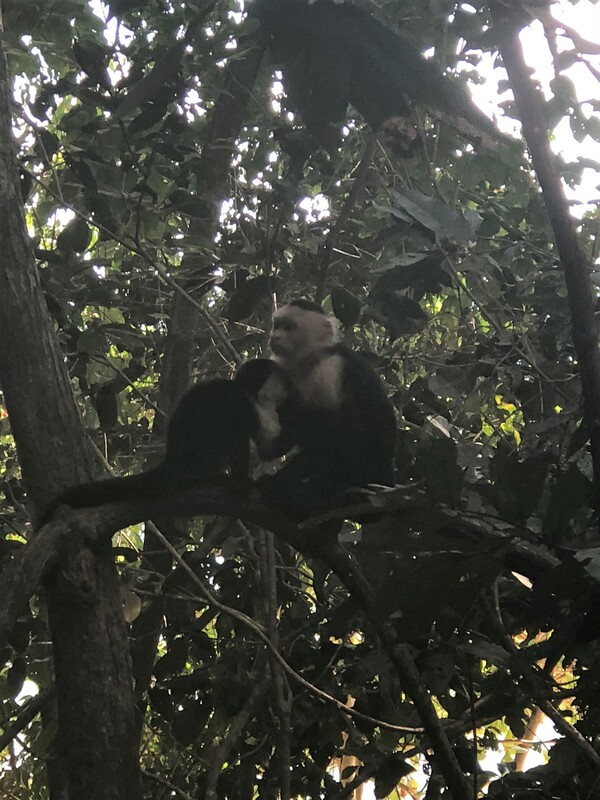 These are probably the most well known in Costa Rica and the most notorious. As they have become so used to people (and with people comes food), they will gladly take any snacks off your hands if you aren’t watching them. I observed these critters checking out any open back that wasn’t being watched too closely. Opportunistic little things. While I was looking at the water, one even ran by me with a whole coconut! He gave me a side-eye as he passed just daring me to tell him he couldn’t have that coconut. It was hilarious. 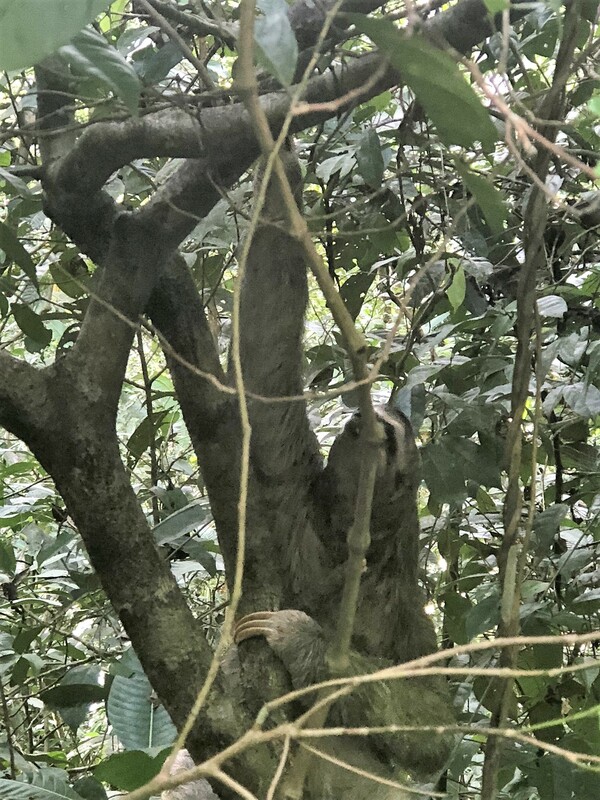 Did you know anteaters can climb trees? 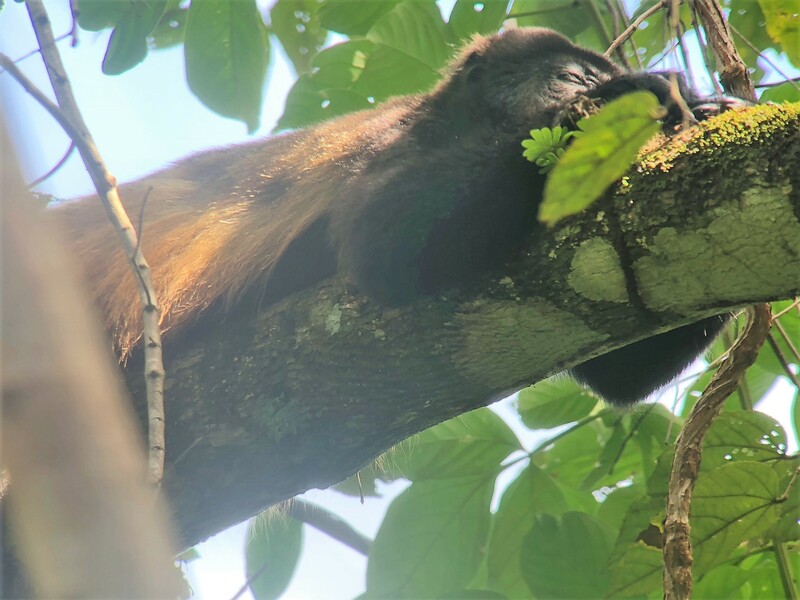 Driving in Costa Rica can be a challenge. Never mind the traffic in San Jose because what major city doesn’t have traffic? I’m from Atlanta where the rush hour is nothing short of legendary. (Seriously, if you had plans around 5 or 6 than you left at 4 or you were going to be way late). No, it becomes a challenge when the roads begin to go into the mountains. Suddenly you’re faced with twisting roads and sudden unpaved portions. But in spite of that? It has allowed me to see parts of the country that might not be visible to the average tourist. I drove to small town after small town. I saw so many small roadside restaurants (called “sodas” here). And so many breathtaking views of being in the mountains, as high as the clouds. My inner child squealed when I stopped and realized that the fog I was seeing was, in fact, the clouds. How many have had that thought on airplanes? 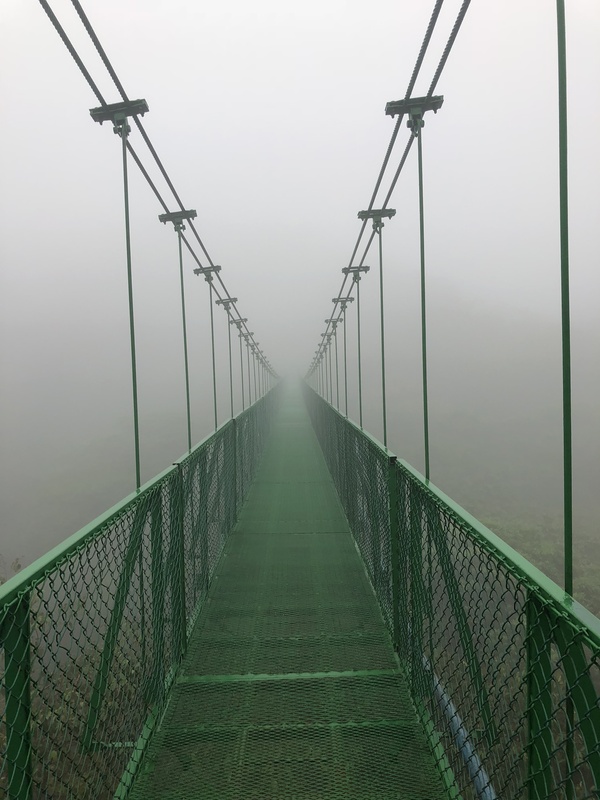 What it must be like to be able to touch the clouds? Or, at least, be in them? 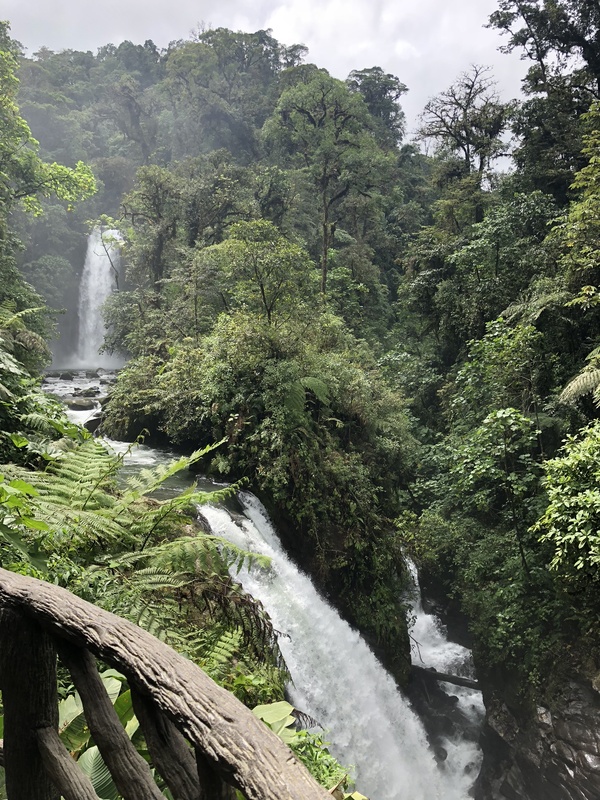 It made the perfect setting for my last minute detour to the La Paz Waterfall Gardens. 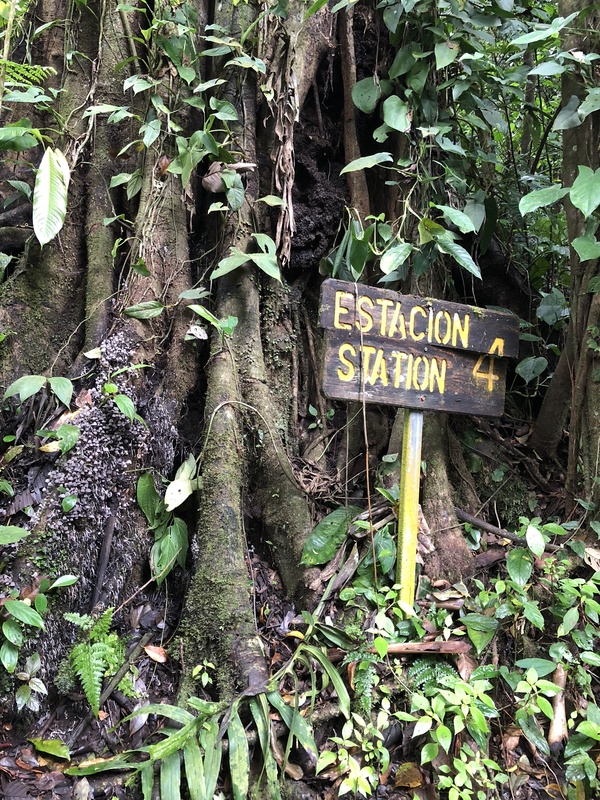 I had read about this nature park a couple time but couldn’t figure out if it made sense to try and stop on my way to Arenal. I wasn’t even sure if it was on the way. Like I said, the roads are twisty. But, as luck would have it, I drove right by it, so it made the perfect mid-morning stop on my 3 hour drive. The park consists of several trails and exhibits. 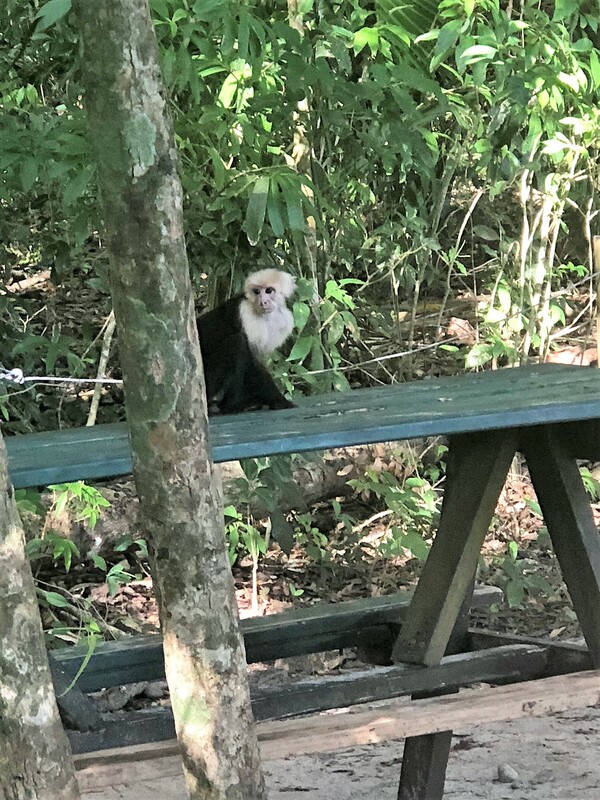 There are hummingbird gardens, jungle cats, monkeys to visit. But the piece de résistance is truly the 0.8 km trail to see the waterfalls. Though it is a short distance, most of the trail is comprised of many steep staircases. 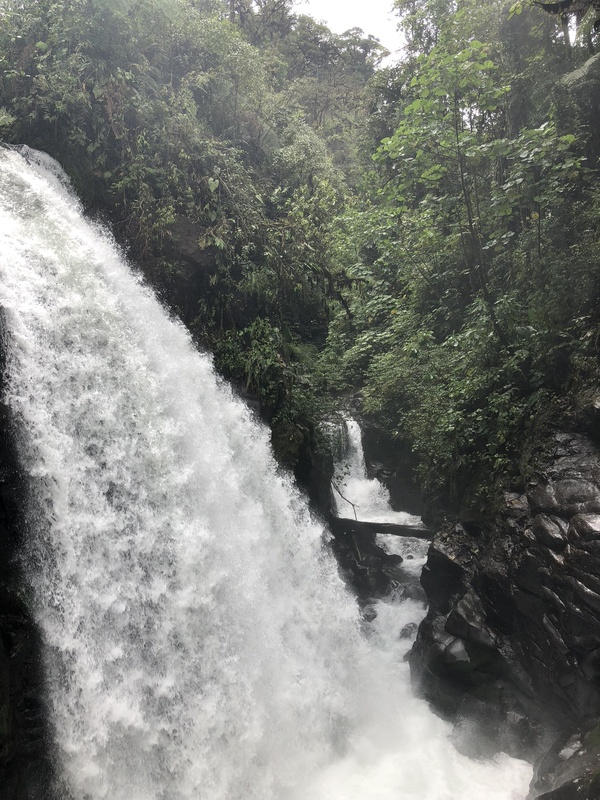 My knees and calves were not happy but it was breathtaking to get up close to these powerful waterfalls (and a little soggy, I regretted leaving my waterproof jacket in the car). Though I only allowed myself a couple hours, it would’ve been easy to spend a whole day exploring every nook and cranny. But move along I did. After a good stretch of rock and gravel road, the Arenal volcano began to loom in the distance. Though it is now dormant, it was still a powerful setting as I made the trek up to my hotel. Nothing short of magnificent really. It looked like every postcard or guide book cover I had ever seen about Costa Rica. And though I do not have cell service, it’s a peaceful setting. Each night is silent save the sounds of the jungle. 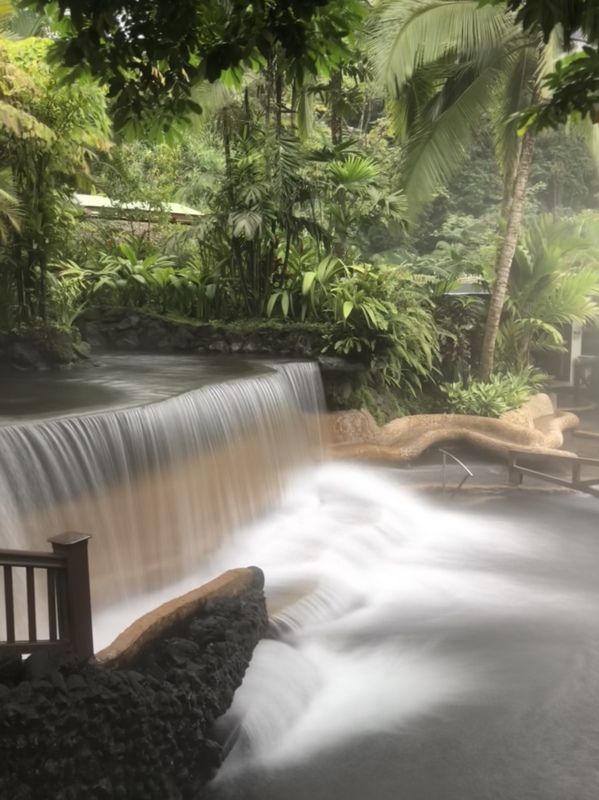 After a day of rest and exploring the nearby town of La Fortuna (and by exploring it means I wanted a beer – there are some pretty decent local beers around here), my next day was spent at the hot springs. Most of the resorts in the area offer thermal pools so I had my pick. 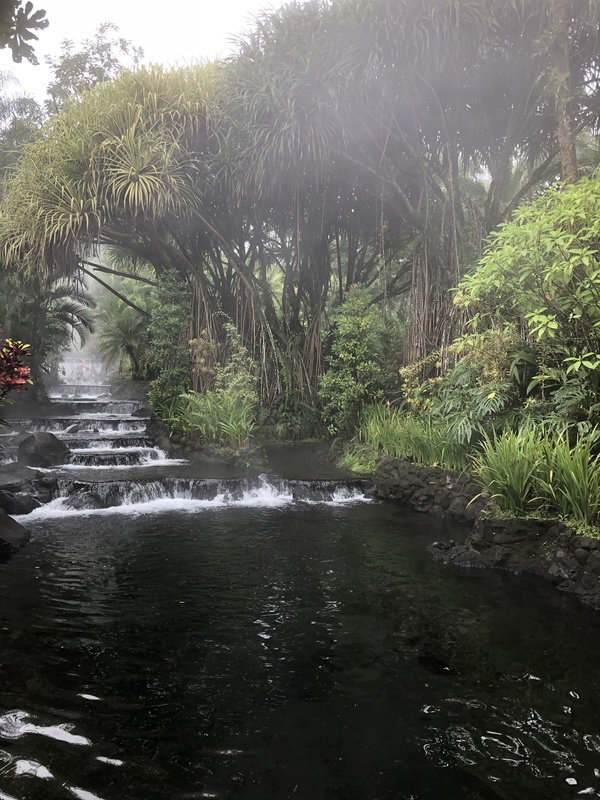 I went to the Tabacon Resort and relaxed for the morning. It was predictably beautiful but it was neat meandering through the winding paths to the various pools. I particularly enjoyed sitting behind one of the waterfalls. I probably could’ve spent the whole day behind there, people watching through the glass-like water. If there is one thing about traveling alone is that you can be entirely focused on your own experience and, for me, it gave me brain time to stop and just not think about anything. For anyone who knows me, my brain rarely stops thinking about anything. (It is what I attribute my life-long insomnia to). But for a solid block of time, it was just me, sitting behind a waterfall. 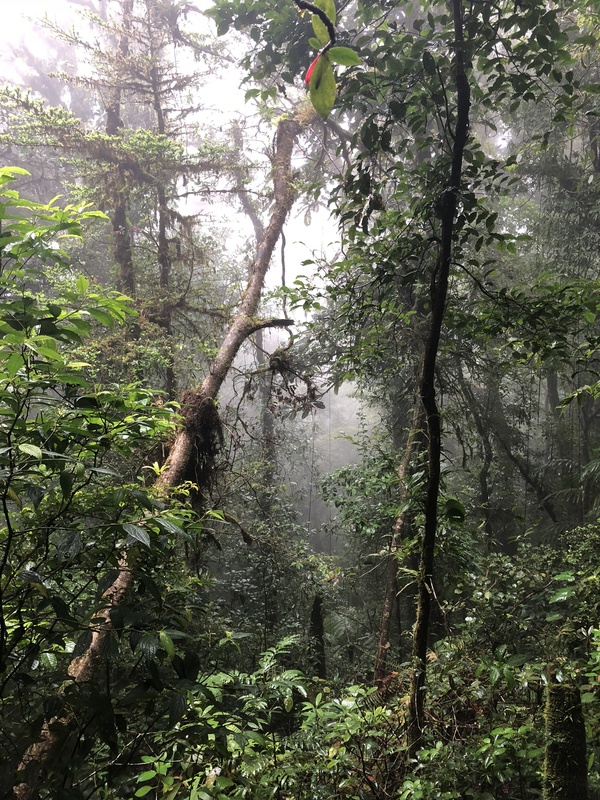 My last day in Arenal consisted of a truly excellent 4 mile hike into one of the private jungles that are around. There were hanging bridges and two very pretty waterfalls. We had a guide who knew more about random plants than I ever thought possible. We smelled natural citronella and black pepper (which the latter smells like licorice, who knew). 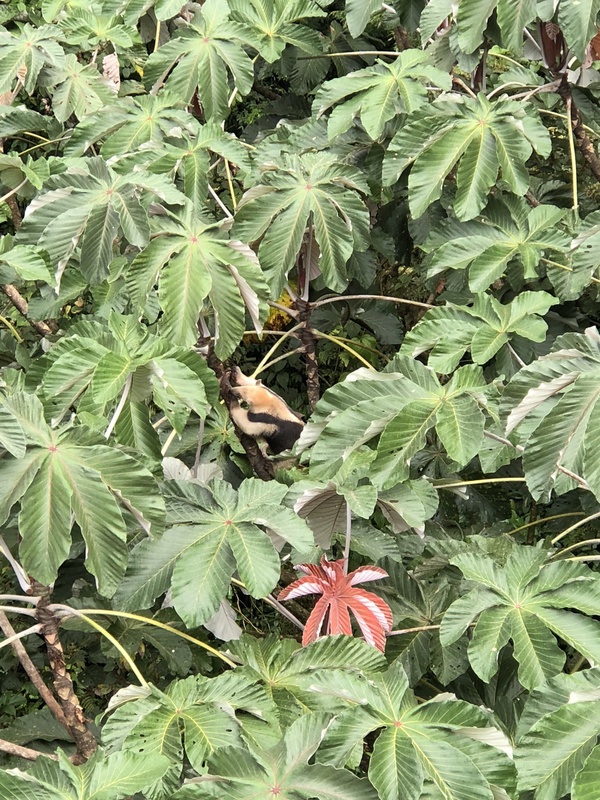 We saw an anteater up a tree. An baby eyelash viper curled around a low hanging branch. There was a tarantula in her nest (the guide named her Gloria) and a wandering spider down a pole. 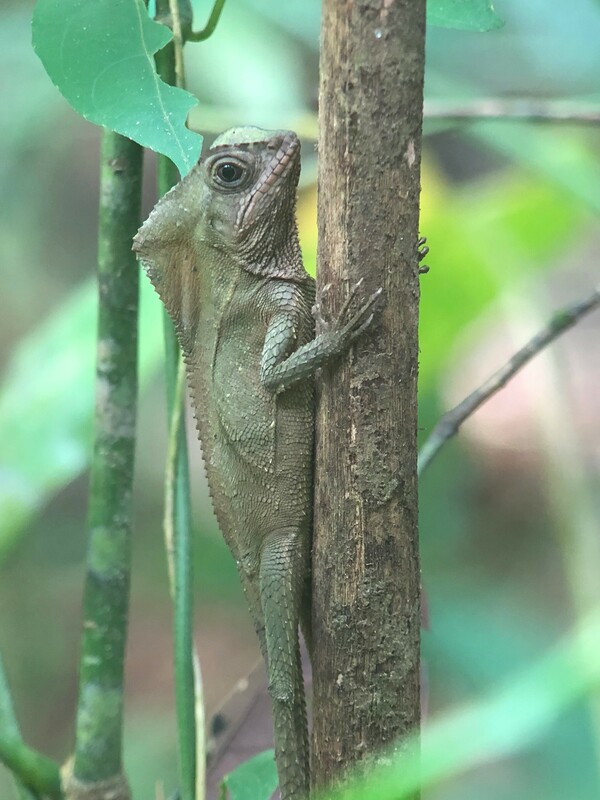 Did you know that there is a species of tree that is called a “walking palm?” The roots will gradually move over time so that the tree itself moves. It was tiring, muddy and great. I learned so many different things that even if the final hill was brutal, it was worth it. 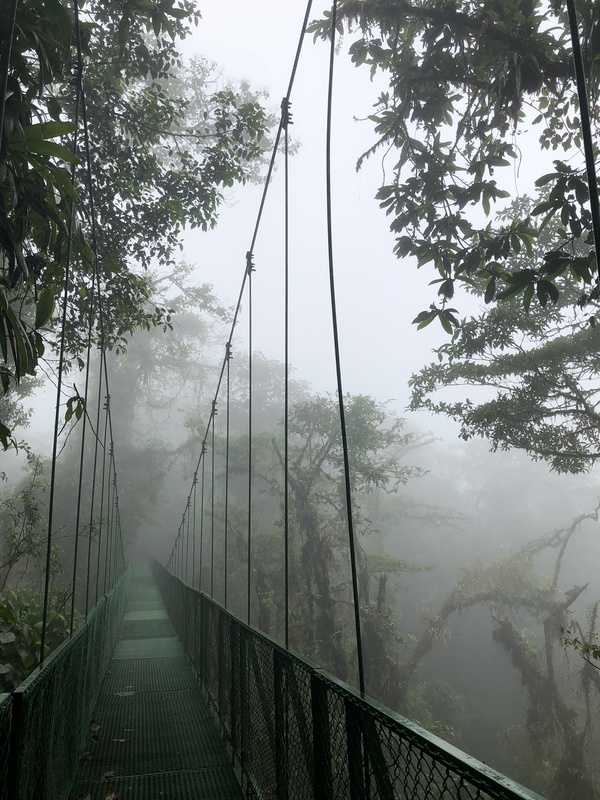 Even though Costa Rica is experiencing a cold front that makes the rain more biting, it was great to be in the jungle. 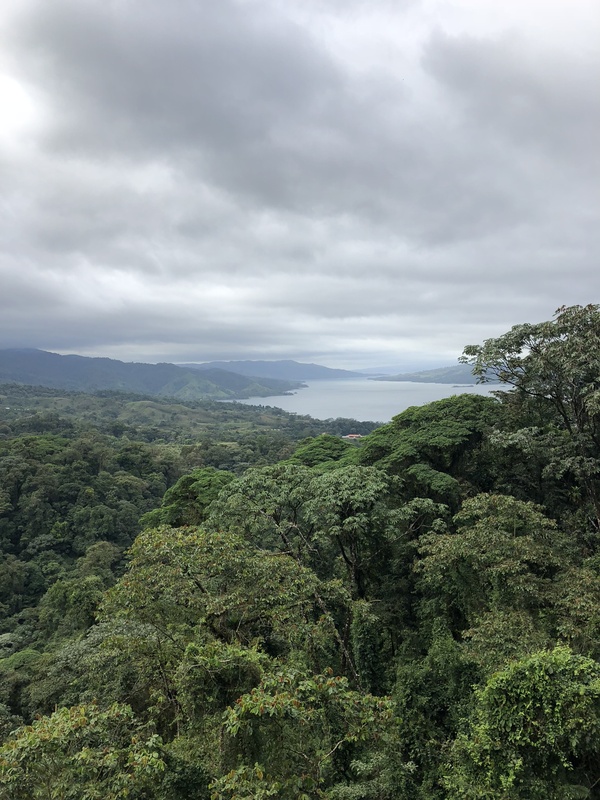 Today, I made the drive up the mountain and into Monteverde. It was a bit of a stomach-clenching drive due the last stretch being a dirt and rock road. With every dip in the road, I sent a word of thanks that I had last minute upgraded to an SUV. But I made it. 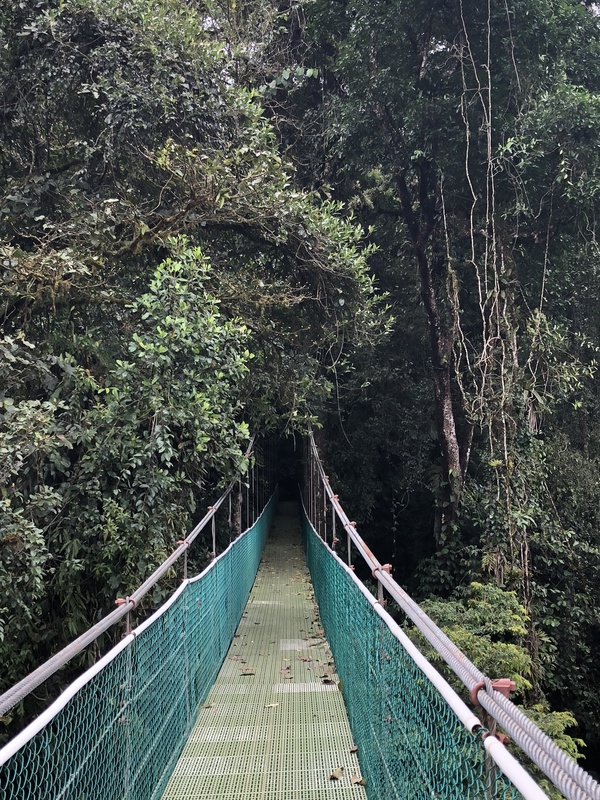 Tomorrow is ziplining in the canopy which something that simultaneously excites and scares me. But I always tell myself that I never want to let fear prevent me from doing anything at least once. It will be fine. And probably wet. 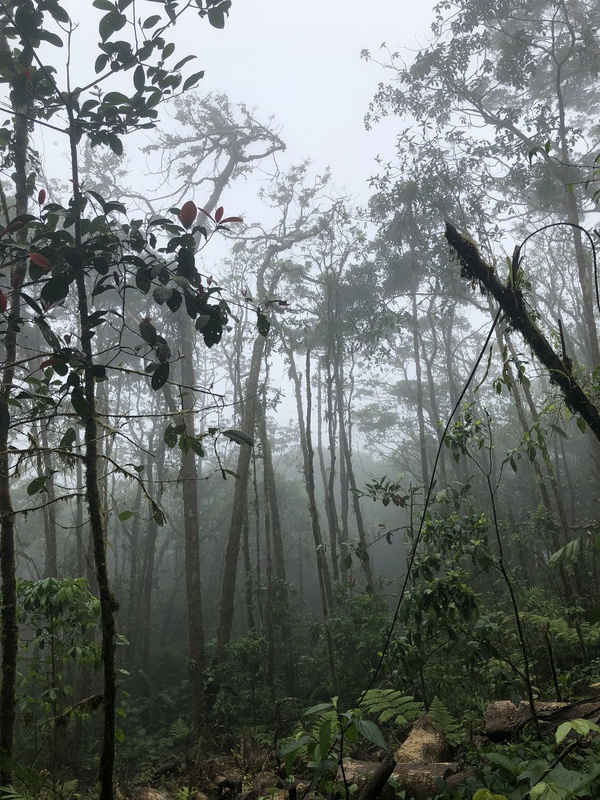 If it’s one thing I’ve learned about being in the rainforest….is that it’s never really dry. 6 more days left in this beautiful country!